Trump Calls For 'Space Force' To Defend U.S. Interests Among The Stars The president wants a "separate but equal branch" of the military to watch over the final frontier, but only Congress can make it happen. 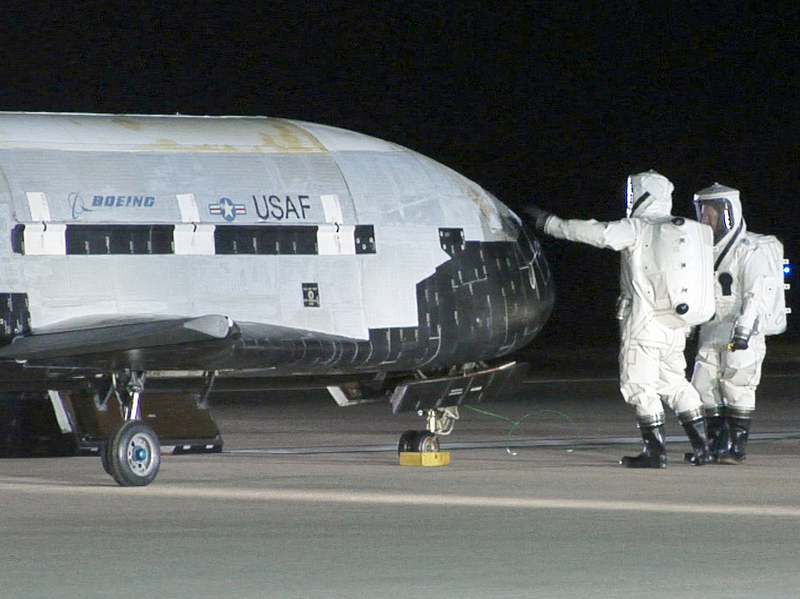 The Air Force currently oversees many of the military's space activities, such as the experimental X-37B spacecraft. "I'm hereby directing the Department of Defense and Pentagon to immediately begin the process necessary to establish a space force as the sixth branch of the armed forces. That's a big statement," the president continued. Experts were quick to point out that President Trump cannot actually create a space force. A new branch of the military can only be established by an act of Congress — something that hasn't happened since the Air Force was split from the Army in 1947. 2) The president can't just create a new military service on his own. It requires congressional authorization. "Last year the House passed a bill that would have created a space corps," says Todd Harrison, director of the Aerospace Security Project at the Center for Strategic and International Studies. But the plan died in the Senate. Harrison adds that a space force would not involve actual military personnel in space. The 1967 Outer Space Treaty states that no nation can claim territory in space, nixing the usual rationale for a troop presence. It also prevents the placement of nuclear and other weapons of mass destruction in orbit. "There's no space marines; there's no people flying around with jetpacks," Harrison says. Rather, a space force would consolidate command of the military's existing satellite systems into a single command. Those include reconnaissance satellites, GPS, missile-warning systems and communications platforms. The U.S. military and intelligence agencies are increasingly concerned about the vulnerability of space-based systems. Both China and Russia have conducted tests of anti-satellite weapons that could potentially knock military satellites from orbit. Harrison adds that ground-based lasers can blind reconnaissance satellites, and spoofing signals can confuse GPS. The Air Force, which currently oversees many of America's space systems, is already well aware of the threat. "We expect space to be a contested domain," Air Force Secretary Heather Wilson said in a Senate hearing last June. "We need to anticipate that any future conflict will involve conflict in space." The Air Force also wants to keep hold of its role in space warfare, says Harrison. "The biggest opponent for creating any kind of space force has been the Air Force," he says, but he adds that the president's comments may end the debate inside the Pentagon. "Now that the president has given this order to the military that this is what he wants to do, they're not going to be able to oppose it." "Our Policy Board will begin working on this issue, which has implications for intelligence operations for the Air Force, Army, Marines and Navy. Working with Congress, this will be a deliberate process with a great deal of input from multiple stakeholders."